We have arrived at the halfway point at Penny Black and More challenge, so today I am sharing my second card for the challenge where our theme this month is simply Anything Goes. The usual rules apply: focal point has to be a physical stamp, meaning no digi stamps or die cuts as focal, the only exception are Penny Black stickeroos. Some great prizes are up for grabs so don't miss your chance to be entered into the drawing! I used another one of Penny Black's newer stamp sets: Happy Together, currently available in my Etsy shop. I've recently used the other stamps from this set, if you missed those cards and would like to see them you can find them HERE and HERE. A beautiful floral set perfect for CAS cards I think! I stamped the image using my TONIC Stamp Platform and Memento Tuxedo black ink on Copic Xpress It blending card. I used Copic markers for coloring (YG11, YG17, B000, B02). The striped paper is from my stash, light blue card stock is by Stampin Up. I know the butterfly is at an odd place, but right after I was done coloring I got an ink smudge in that spot and didn't want to throw the whole card away because of it. So I remembered the saying: there are no mistakes only opportunities to embellish (or something similar :) and decided to just add a butterfly (which is part of the stamp set). That's all for today, thank you so much for visiting and don't forget to stop by the challenge blog to see what the rest of the team made and to link up your creation! A great creation using the very pretty Stcikeroo for our mid month inspiration Ellie, many thanks. What a lovely card and the colouring as always is fantastic. I've not seen this set before. This is gorgeous! LOVING the cacti!!!!!!! Super card and love the image. So eine zauberhafte Karte, deine Karte wirkt so super frisch! Such a lovely thank you card! I love the succulents! SO gorgeous and bright! I'm from Arizona, so I love to see cacti and succulents all dolled up so nice! 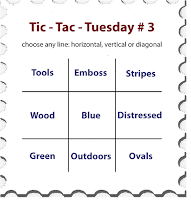 Your layout is so striking - good tic tac toe choices! Thanks so much for playing at TSOT! such a sweet card, ellie! i've not seen this set yet either. Lovely bit of stamping! Thanks for joining us at Stamping Sensations this month.